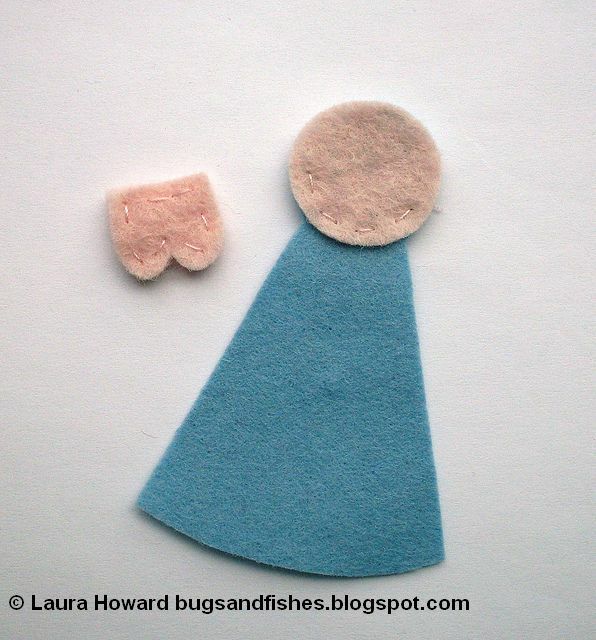 1) Cut out all your felt pieces - 1 x face, 2 x body, 2 x feet, 1 x hair (front) 1 x hair (back) and 1 or 2 x wings (the wings need to stay upright so if your felt is very soft and flops easily, cut two pieces). 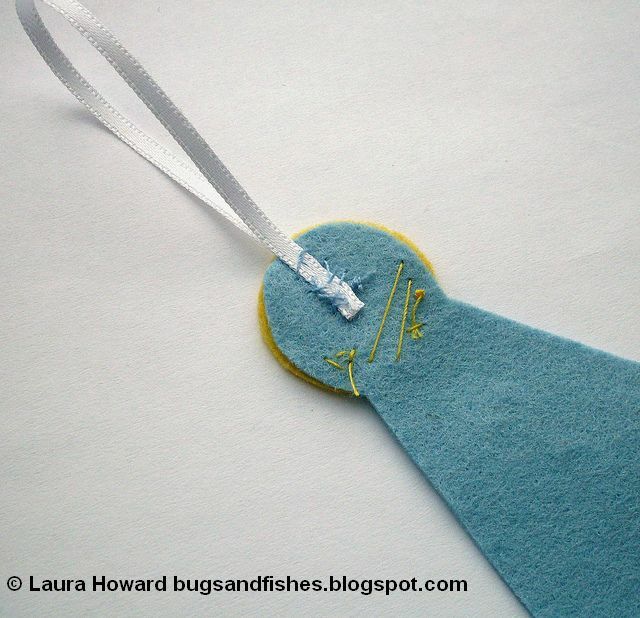 2) Use running stitch in matching thread to sew the two feet pieces together, finishing your stitching neatly at the top. 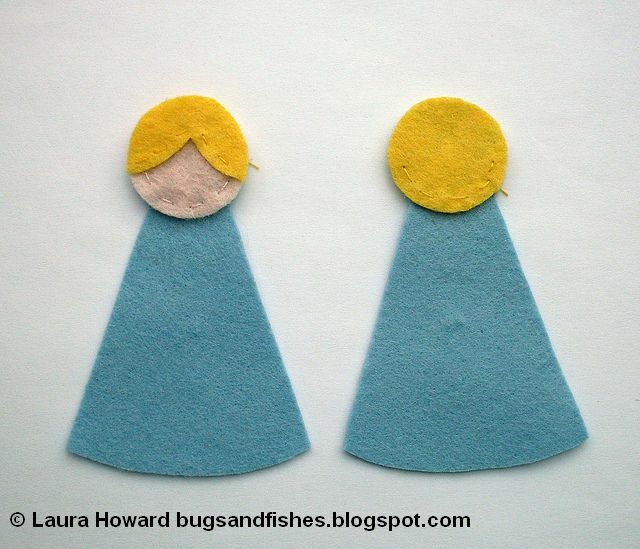 Use the same thread to sew the face in position on one of the body shapes - you just need to sew around the bottom half of the circle. 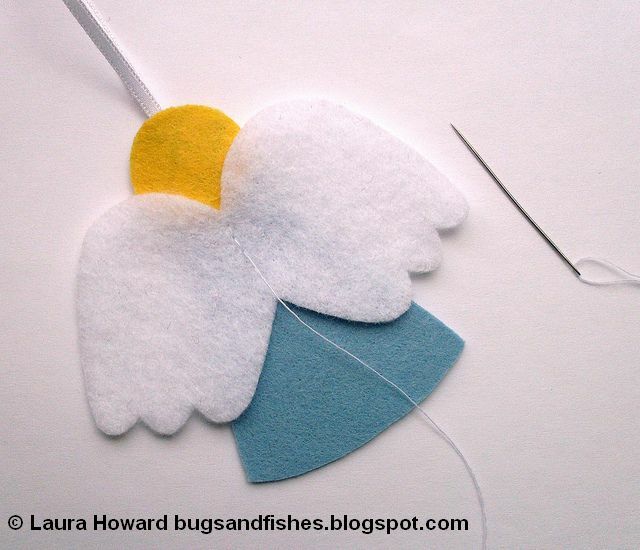 If you've cut two felt pieces for your wings, sew them together with running stitch in white thread and finish your stitching neatly in the middle (where it will be hidden when the wings are sewn onto the angel). 3) Now sew the front and back hair shapes in position, using running stitch in matching thread. Sew the front piece onto the face, sewing along the bottom edge only. Then sew the back piece onto the second body shape (make sure you flip this over first so it will match up with the front when you sew them together later! ), sewing around the bottom half of the circle as before. 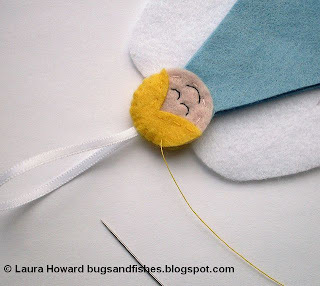 4) Now use black thread to sew two (closed) eyes and a smiling mouth. Use back stitch and very small stitches to create the curved lines. 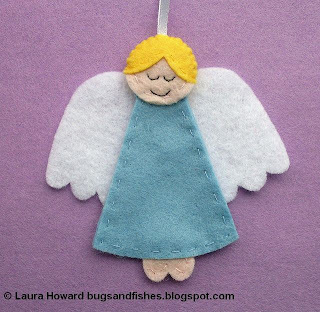 You might want to practice this on a scrap piece of felt before sewing the expression on your angel. If you prefer, you can use two small black seed beads for the eyes. Sew the beads flat (like an O) on the felt, using three or four stitches to hold each bead in place. 5) Cut a 5 inch (12.5 cm) length of narrow ribbon, and fold it over to form a loop. Sew the ends to the top of the ornament as shown, so they'll be hidden within the two layers of felt when you sew them together. 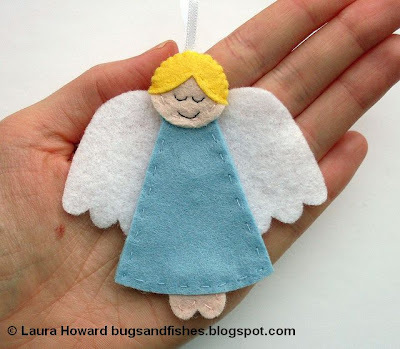 Use whip stitches, and sew into the felt but not through it (if you prefer, sew the ribbon to the piece of felt which will become the back of the ornament, and use thread to match the felt so any stitches that show through will be less visible). 6) Use back stitch to sew the wings onto the back of the angel -sew a vertical line down the middle of the wings to hold them in place. 7) Place the front and back angel pieces together, then use whip stitch in matching thread to sew the front and back of the hair together around the outside edges (you may need to hold the wings back during this step and step 8, so they're not in the way as you sew). 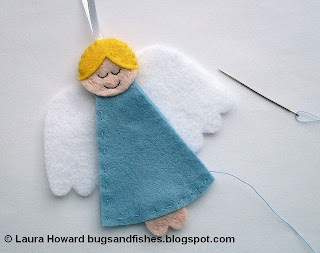 8) Finally, use running stitch in matching thread to sew the front and back of the angel's dress together. When you sew along the bottom edge, tuck the feet unbetween the two layers and sew over them so they just peek out, as shown. So Sweet, my daughter will love making this. 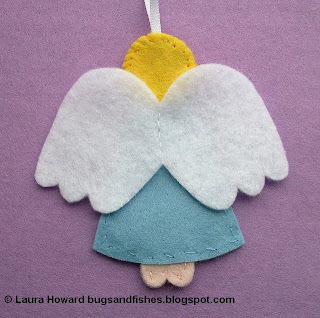 I used your template to make my clay angel ornament. Thanks. c'est toujours un trés beau travail ! Thank you so much for your wonderful felt Christmas tree ornaments. 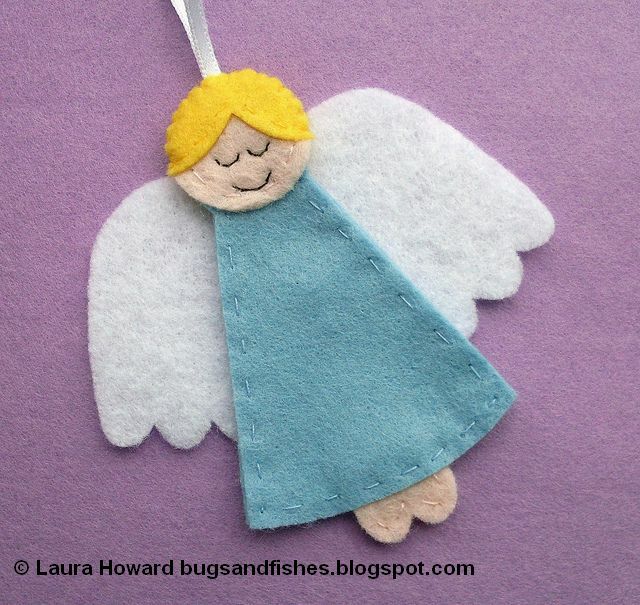 I've pinned them all and look forward to making them. Your time and efforts to post such wonderful ideas are greatly appreciated! Thank you!